Independent candidate Greg Orman is leading incumbent Republican Sen. Pat Roberts in Kansas by 10 points, while Democrats have a slim lead in North Carolina’s contest and both candidates are in a dead heat in Iowa’s Senate race, new NBC News/Marist polls find. The Kansas poll, which shows Roberts trailing 38 percent to Orman’s 48 percent, is full of bad news for the incumbent and for Republicans, who have suddenly seen Roberts’ sleepy re-election race turn into a very real pickup opportunity for Democrats if Orman decides to caucus with them. In the North Carolina Senate contest, Democrat Kay Hagan has a slight advantage over Republican Thom Tillis – 44 percent to 40 percent among likely voters, while the Iowa Senate race between Republican Joni Ernst and Democrat Bruce Braley remains neck and neck, 46 percent to 44 percent. Republicans can boast of having the strongest candidate out of the three state polls: Incumbent Gov. Terry Branstad, who’s up by 22 points over Democrat Jack Hatch. 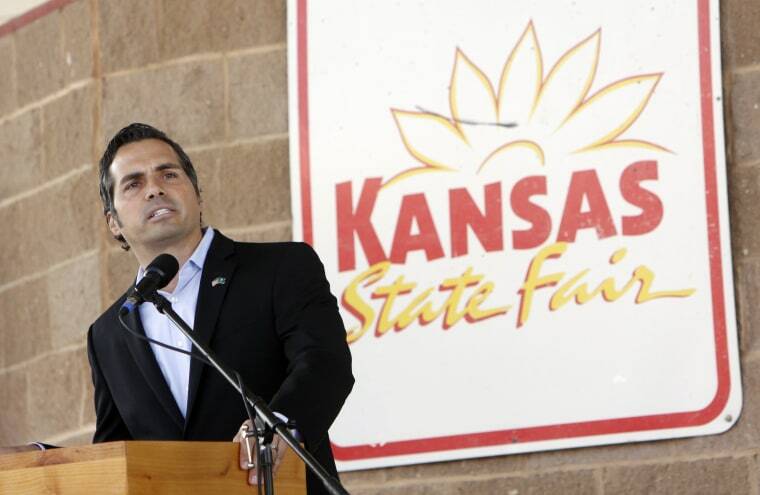 But another Republican governor is in the fight of his political life. Republican Gov. Sam Brownback is locked in a dead heat with Democrat Paul Davis, 43 percent to 44 percent. While some Democrats are faring somewhat better than expected in North Carolina and Kansas, any resilience they are showing isn’t exactly due to an outpouring of positive sentiment in each state towards their party’s leader, President Barack Obama. Obama’s job approval rating sags at 39 percent in North Carolina, 39 percent in Iowa, and just 35 percent in Kansas. The unexpected shakeup in the Kansas race after Democrat Chad Taylor’s abrupt exit knocked longtime Sen. Pat Roberts onto his heels. Only 37 percent of likely voters say they have a positive opinion of the incumbent, who’s seeking his fourth term in the Senate, compared to 47 percent who have a negative opinion. Over 45 percent of likely voters give Orman a thumbs up. Orman is also benefiting from cross-party appeal. Seventy-seven percent of Democrats and 16 percent of Republicans say they’re picking Orman over Roberts. Just eight percent of Democrats support Roberts, meaning that he’s losing two Republican voters for every Democrat he gains. He’s got high negatives, his intensity of support is low, he’s losing independents by more than two to one. His to-do list is rather large in the remaining time before Election Day. Orman is also winning independents by more than two-to-one, picking up 57 percent of independent support while Roberts gets just 27 percent. And a majority of Orman’s backers – 55 percent – say they’re backing the independent candidate mostly because they’re against his opponents. The silver lining for Roberts: Orman remains relatively undefined. Among likely voters who back him, only 48 percent say they’re firmly committed to him. And 28 percent of likely voters say they haven’t heard of him or aren’t sure of their opinion about him. Randall Batson, a libertarian candidate, is picking up about 5 percent support, according to the poll. Gov. Sam Brownback is also struggling among key demographics as he fights to keep his job amid the backlash from a series of unpopular budget cuts. While 85 percent of Democrats support their candidate, Paul Davis, more than two in ten Republicans say they’re not ready to back Brownback. Davis is winning independents 49 percent to 34 percent. Brownback's job approval rating among likely voters sits at 40 percent. Twenty-two percent of Republicans and 62 percent of independents give him a thumbs down for the job he's doing as governor. A gap in gender and marital status characterizes the close contest between Democrat Kay Hagan and Republican Thom Tillis in North Carolina. Hagan carries women by 19 points and has almost a three-to-one advantage with single women, while Tillis is winning men by 13 points and ahead with married men by 23 points. Hagan gets 84 percent of the African American vote, while Tillis leads among white likely voters, 52 percent to 31 percent. A barrage of negative advertising has taken its toll on both candidates, who each have upside-down favorable ratings. Forty-eight percent of likely voters have a negative view of Hagan, while 42 percent have a favorable one; for Tillis, the split is 47 percent unfavorable / 36 percent favorable. Libertarian candidate Sean Haugh takes seven percent of the vote. Ernst has a narrow lead of two points in this race, within the margin of error. But she appears to have an advantage when it comes to enthusiasm. “It’s all much more about Ernst than it is about Braley,” Miringoff says. More than six in ten Ernst supporters said they chose her because they actively support her candidacy, while 34 percent said their backing of Ernst was a protest against Braley. But those numbers were flipped for the Democratic candidate. About six in ten Braley backers said their vote was mostly due to opposition to Ernst. And 62 percent of Ernst supporters were firm in their decision between the candidates, compared to 51 percent for Braley. The polls were conducted September 27th through October 1st. The margin of error n the North Carolina poll is +/- 3.8 percentage points. The margin of error for the Iowa poll is +/- 3.5 percentage points. The margin of error for the Kansas poll is +/- 3.9 percentage points.